Axiom GB has designed, manufactured and installed a goods-in sortation system for the onwards dispatch of examination materials at Cambridge Assessment. The new sorter has doubled the speed of sortation for highly sensitive materials, allowing the department to sort up to 10,000 packets a day by their onwards destination. Superdrug’s Northern Distribution Centre at Pontefract is home to the company’s growing e-commerce operation. Due to the volume of sales and predicted expansion an automated sorting solution has been installed as part of an integrated solution from independent integrator Logistex. Axiom GB has designed, manufactured and installed a packet mail sortation system into B2C Europe. The sorter has automated B2C Europe’s parcel and pack sortation, enabling the company to sort up to 8,000 packets an hour. This has given the company the futureproof ability to handle three times its current volume without making any significant changes to staff numbers or facilities. Axiom, the sole UK company to manufacture sliding shoe sortation systems, has launched a pioneering new machine, the Axiom SS4. Axiom GB has designed, manufactured and installed an automated labelling and sortation system for Cinram Iberia's logistics operation based in Madrid. The high speed system is being used to scan, label and sort randomly sized media products, processing them to a 40 destination sorter at a speed of 180 items per minute. Axiom GB has completed an automated packing line solution for JD Williams, the UK’s largest independent home shopping retailer, at its Lilac & Briar Mill facility in Shaw, Lancashire. Axiom GB has designed and installed an automated processing, bagging and sortation line for mobile phones and tablets at Unipart Technology Logistics (UTL). The automated line has resulted in a tenfold increase in throughput for these products, to just over one thousand orders an hour. 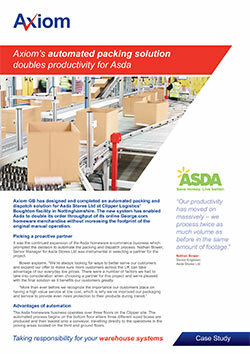 Axiom GB has designed and completed an automated packing and dispatch solution for Asda Stores Ltd at Clipper Logistics' Boughton facility in Nottinghamshire. The new system has enabled Asda to double its order throughput of its online George.com homeware merchandise without increasing the footprint of the original manual operation. Tamar Foods bake own label savoury pies, slices and snack foods for leading supermarket chains. Tamar is part of the Samworth Brothers group which, amongst others, owns Ginsters and it is Ginsters that distributes the Tamar product to retailers throughout the UK. Tamworth based, Axiom GB, has manufactured and installed an automated packing solution at Lakeland's mail order distribution centre in Kendal. The new system has been designed to nearly double the productivity of Lakeland's operation whilst reducing costs and presenting a better finished parcel for the customer. Tamworth based, Axiom GB, has designed, manufactured and installed a complete conveyor picking solution and warehouse management system into Unifix's National Distribution Centre (NDC) in Smethwick. Axiom GB has designed and integrated a new software system to control the picking, sorting and checking of orders at PMS International, one of the UK's leading suppliers of household goods and soft toys to the retail trade. The new software has improved the efficiency and accuracy of despatch operations, cutting costs and enhancing customer service.